One thing that I have been struggling with when building paper models is the inability to repaint a model to some version I want. I understand how the technology works but I have a hard time with the control, the layers, blending and the like. This repainting is how Roman Hruska possibly started with his repainting/designing career. 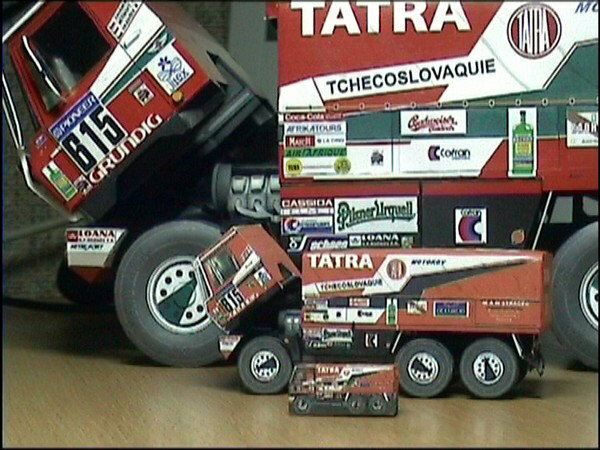 Roman started repainting a couple of simple models of Tatra trucks which competed in the Dakar. 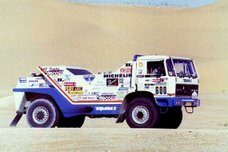 Roman's claim to fame is a beautifully detailed Tatra 815, the truck competed in the 1988 Dakar, and is a 6x6 model. The cool thing about this kit is the 1:100 Minibox clone, and the 1:300 model. Roman is working on a 1:32 model of the massive looking Tatra 8x8 truck. In between these models Roman has released, what I would term, One Nighters, models on one page, and you could do it in one night. Most of the models are truck models, but Roman has also a free standing model of the engine which is in the 6x6. Well..... not exactly, but close. It is made of paper, and it has a design printed on it, is it a model, not exactly. It is a jigsaw puzzle, not one but two. To me jigsaw puzzles are another form of escape, just like making models. Mom asked me last year, what did I want for Christmas, so I went looking for something Dakar related. I stumbled onto two puzzles, one with 500 pieces and the other with 1500. The 500 piece puzzle I bought myself, couldn't wait, the 1500 piece monster, I asked for that one. The 1500 piece puzzle was drawn by Blauchon, a European artist, who does alot of comedic drawings, lots going on, all in one picture, and is published by Heye, a French puzzle company. The 500 piece puzzle, published by Nathan, another French puzzle company, depicts a temple of some kind, in Africa. The photo was taken by the official Dakar photographer, Maindru, it's their Toyota in the image. These are the only two jigsaw puzzles which are Dakar themed, which I am aware of, so if you find one, let me know. So you will be able to see what I say is not a figment of my over active imagination. I have started to use PicasaWeb, a free photohosting site, along the lines of image shack or photobucket. PicasaWeb is powered by Picasa and Google, and is in beta now. Here is my Dakar album, over time I will be posting more and more pictures of the models I will be building and hopefully finishing. I hope you enjoy looking at the pictures, as much as I had building the models in them.